A perfectly made chocolate ganache is smooth and shiny and doesn’t have any air bubbles. 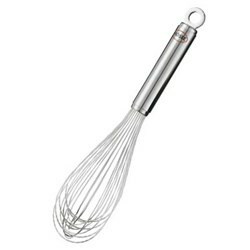 Whisk slowly to keep it smooth. In its simplest form, ganache is an emulsion of equal parts of chocolate and heavy cream. Small amounts of corn syrup or butter are sometimes called for in some recipes. By varying the proportion of chocolate to cream, or the temperature, you can vary the texture of the finished product. Increase the cream to make a ganache that, when chilled, you can whip like cream. Increase the chocolate and you get a truffle filling. Pour it warm over a cake and you have a thin glaze, or pour it over ice cream, and voilà: a simple chocolate sauce. Use it to sandwich cookies together. Or cakes. Or meringue discs. Possibilities are nearly limitless. Ganache can be made with dark, milk or white chocolate, but make sure that you use high quality chocolate. With only two basic ingredients, inferior chocolate can’t be camouflaged. 2 Why Not Leave the Cream in the Pan? 3 What Do I Do If My Ganache Breaks? I have made plenty of batches of ganache in my time. I have added the chocolate to the cream and I’ve added the cream to the chocolate. Best practice, to minimize the small potential of the chocolate seizing while you’re making ganache is to add the chocolate into the cream. Chocolate seizes when there is not enough liquid to keep the cocoa solids from clumping together rather than going into solution. So, if you add the cream to the chocolate, there’s a slight chance that, as you add the cream to the chocolate, some might seize before you can finish adding all the cream. In order to keep that from happening, dumping the chocolate into the full amount of cream is a safer way to go. Heat cream to a high simmer. Pour cream into a bowl. Dump chopped chocolate into the bowl of hot cream all at once. Let sit for 1 minute to allow the chocolate to melt. 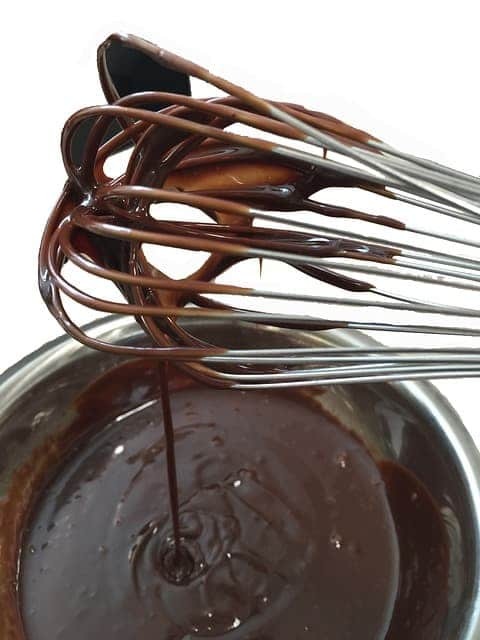 Whisk slowly but thoroughly to emulsify the cream and chocolate into a shiny, deep brown, dark chocolate ganache. Why Not Leave the Cream in the Pan? The main issue here is if you pour your chocolate into the hot pan, you run the risk of the chocolate burning when it hits the bottom of the pan. It’s much safer to pour the cream into a bowl first. No chance of burning your chocolate that way! 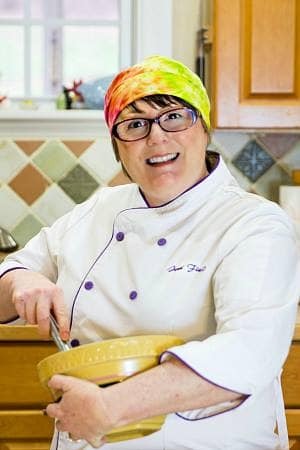 What Do I Do If My Ganache Breaks? I wrote a post about how to save your ganache if it breaks. The great thing about this technique is that it doesn’t change the texture of the ganache. Ganache is suitable for everything from a quick fudge sauce for ice cream to frosting or filling for a cake to centers for truffles. ***Proportions will be different for white and milk chocolates, , and because they contain milk solids, they can be a bit temperamental and more susceptible to breaking. Chop your chocolate fine and put it in a big stainless steel bowl. Heat cream (and corn syrup/butter if the recipe calls for it) just to a boil. Remove from heat and pour over the chocolate. Let this mixture sit for about 5 minutes (this, in effect, tempers the two ingredients: the temperature of the chocolate rises while the cream's temperature lowers. It's easier to make them combine when the temperatures are similar). Then, stir the mixture with a whisk slowly to combine into a rich, shiny emulsion. Don't whisk quickly; you don't want to create air bubbles. 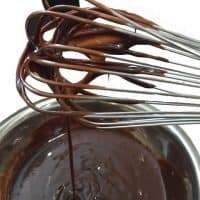 Once you have your lovely ganache, there are so many things that you can do with it: If you pour it while it is still warm, you can glaze cakes, eclairs, cream puffs or even doughnuts with it. Chill a 1:1 ganache and whip with a stand mixer until light and fluffy. Use this to fill and/or frost a cake. Chill a 1:2 ganache and scoop with a small disher to make traditional truffle centers. Nutritional information based on 1:1 ratio of cream to chocolate. 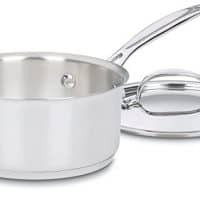 can heavy cream be substitued with something else? 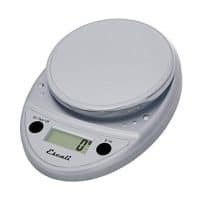 see where i live its very very hard to heavy cream…and i did find it once loong back but it was very very expensive so i was looking for an alternative when its a very festive time then i am okay with the cost but when its not …. i find 25% fat cream here is it possible to use that in some way? Yes, you can absolutely use that. You may have to add a touch of butter to enrich it, but I would go for it, uriko! so semisweet cooking chocolate and 25% fat cream with a little bit of butter and im good? i intend to use it as a frosting….in what proportion should i use chocolate and cream and butter? You’ll want a 1:1 ratio of choc to cream/butter. So maybe 4 oz choc:3.5 oz light cream and .5 oz butter. Scale up to make enough to cover your cake.